Put the soy sauce, ginger and chilli sauce in a dish and mix together. Lay the salmon fillets in the marinade and mix. Put the rice in pot with boiling water and cook until light and fluffy. Steam the chinese leaves and broccoli. Place the salmon, topped with the marinade and sesame seeds in tin foil parcel and place on baking tray in oven. Cook for 15 - 20 minutes until fish is cooked through. 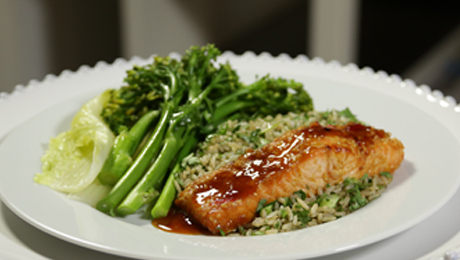 Stir the chopped spring onions and coriander through the cooked rice and serve with salmon.